Last week I had a three-day stint in Prague, Czech Republic, and I loved it. Still, it gave me a lot to think about, and I wrote this in cafes while there. Kafka’s Prague, 1989. Weeks of protests in Berlin led to decades of oppression and division ending with success – East and West Berliners could finally visit friends and family unseen for decades. The wall would come down in 1990. Spurred by Berlin’s success, revolts soon spread throughout Europe’s Eastern Block. Prague’s “Velvet Revolution” unleashed, sending over 200,000 into streets, demanding an end over four decades of Stalinist Communism. Seven days in, crowds grew to over 500,000, prompting the entire Communist Party brass to resign. For a couple years, there was nowhere in the world more inspiring or provocative than Prague and Berlin in 1990. Creatives flocked to both cities, hoping to seize upon the Zeitgeist that had toppled a seemingly unstoppable power. Dawn on the Charles Bridge in Prague, by me. Then, I was 17. Those events played part in my enrolling in journalism and taking words more seriously. Little did I know I would enter college part of the analog age and leave it in digital upheaval. Mine would be the first class to lay out a newspaper on a computer, and a year after I graduated, The Internet was born proper. For over 25 years I dreamed of seeing Prague. Chasing my dream, I parked myself in Old Town, but I did so knowing I would return for something more authentic, less touristy. This time, I too would play “tourist.” Later, I will reside in an apartment in an artsy neighbourhood loaded with cafes and affordable eateries. 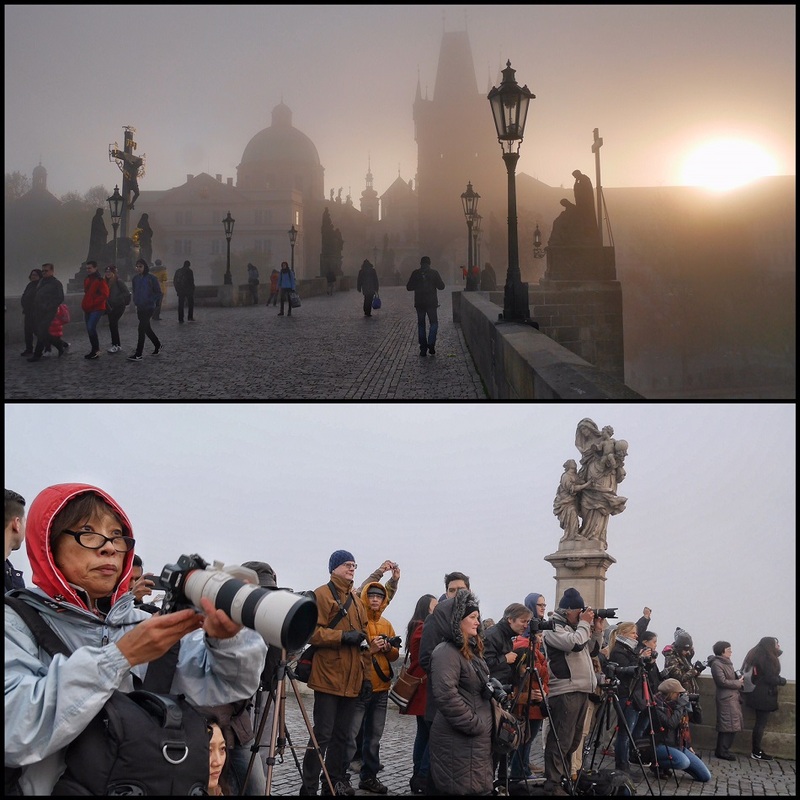 Here’s reality versus the travel dream as a scrum of photographers clamour for photographs of the Prague Charles Bridge in the foggy mystique. In the 27 years since that Velvet Revolution led to Czechs demanding autonomy, this city has become one of Europe’s hottest tickets. I had dreams of coming here in the mid-90s, of getting lost in the swirl of writers and other creatives. That never happened. So, I’m in a weird headspace now. At 43, I know that my “Zeitgeist Age” is beyond me. I still speak truth to power and dream of an inner-revolution within me, but, socaially, I’m old enough to know better. So I’m old enough to know better. I’m in the system now. I play by the rules. My inner-college revolutionary is choked at how well-behaved I am. In 1991, when I graduated, we thought we’d change the world. The spectre of communism came down without shots fired. A peaceful protest of people who’d had enough was all it took to change the world. They redrew maps in ink, not blood. We thought everything was possible. A better world would come. But it’s 2016 and I’m here with the jaded eyes of someone who’s seen the Iran Spring fail and Egypt’s Revolution usher in new players but the same old corruption. I’m in the 99%. Somehow we all got so distracted with Friends reruns and the Kardashians that we didn’t notice the 1% commandeering the world’s wealth and power. It’s fitting, I guess, that in a week Americans go to the polls with the choice between Clinton and Trump, because here I’m having a reckoning with everything that we dreamed then would be possible. The naivety of those halcyon early days post-Velvet Revolution has turned to simmering discontent, not just in me but in the world at large. Everywhere I go, there is anger about corruption but a discordant fealty and resignation that things are the way they are. Or is there? The world today seems rife for change. Politically, extremists clamour for control as they channel the voting public’s angst. We’re all at a loss for those “better days” dreams. Fitfully awake, I find myself still dreaming. Purple haze dawn on the River Vltava and Charles Bridge in Prague. So, here I am, in Prague, the city that helped inspire an entire generation, a whole world. The change that was a-comin’ has long since arrived. Today, Prague is tourist Mecca, the fifth-most-visited city in Europe. And lord, does it feel like it. I’ve pushed and pulled my way through crowds, and this is the off-season. It’s proof capitalism is an ugly beast wherever it rears up. Money is a dirty whore and there’s no place you’ll feel the grinding burn of capitalism than in tourist districts. In a case of “be careful what you wish for,” I walk these streets of the Velvet Revolutionaries and see McDonald’s, Hooters, and more entrenched Americana tucked into alleys and corners. However, it’s not the locals they’re vying to entertain, it seems, but the imported tourists. And it’s not an indictment against Prague, it’s just how the world works now. America got greedy and overspilled its borders. We all got what we wanted, but it don’t mean it’s what we needed. 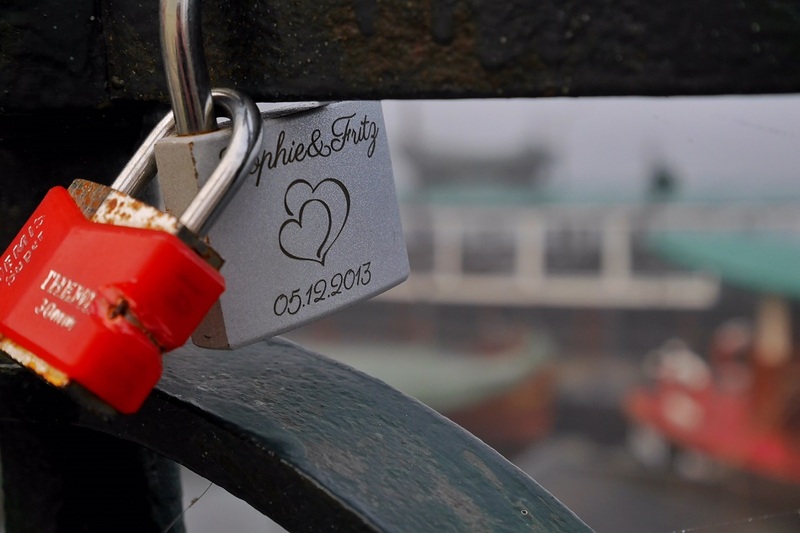 Nothing says you’re serious about your love lock like having it engraved, eh? Being here, now, at this point in my Post-Father life, feels like Prague is the fulcrum upon which I’ll rebalance who I am and what I’m about. In 1990, Prague and the rest of the Eastern Bloc had to learn who they were and what they would be as nations growing up in a new age. Today, in 2016, I’m facing life as an adult orphan. If ever life had a “What now?” phase, it’s when one becomes an orphan while travelling the world. What better place to be, then, right? Prague, baby. The city of revolutionaries and creatives. 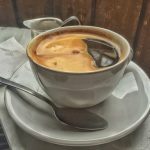 So, what can I tell you about the Prague experience? Not a lot, really. Rather than being some all-encompassing experience, it’s me reconfiguring from a Western life to a European one. Mexico did a weird number on me. When I had returned from Europe in February/March, I found myself outpaced in North America. Life moved faster than I did. I’d fallen into the easy, slow pace of life in Europe and I loved it. I expected Mexico to move slower and, well, it did, but more in an “inefficient” way rather than a “life is beautiful, take the slow road” kind of way. And Europe, it’s different. Different from America, different from Mexico, different. Wars have torn these nations apart for hundreds of years now. They’ve redrawn borders every century beyond time immemorial. There’s a refusal, almost, to relent to political climates. Beyond politics, there is simply life. Whatever happens, whoever is in power, there is good food, good wine, art, and humanity. There’s an unflappable sense that life and politics are distinctly different things. The New Town of Prague lines the Vltava River. That feeling of life being a complicated melange of beauty separated from political realities oozed from a French film starring Jean Reno, in which he plays an olive grower in France’s Provence region. He says dreamily that he likes the simple life in Provence because he wants to “watch life slip by, not fly past” him. North Americans don’t seem to understand that distinction, but I do. I may be beholden to my smartphone and social media, but beyond that, I love being in the world. North America was jarring for me. The hectic pace left me gasping. I felt I was moving in slow motion as I’d amble down streets but others were rushing past. It’s like The Dead Poets Society, where Robin Williams has his students “find their walk” in a courtyard but soon the boys fall into lockstep with each other. Williams used it as a lesson of conformity; no matter how unique we are, our need to belong would see us falling into step with each other. In Europe, I march to my own drum. I walk slowly. I see the world around me. Back home, I slowly felt that falling away from me, and the near-panic with which others seem to frantically rush from one obligation to another found its way into me too. That’s no way to live. A good way to die, but no way to live. I would be ecstatic to spend my life here in Europe, to be honest. I sometimes wonder why I even have the rest of the world on my travel list. Maybe it isn’t. Maybe Europe is all I need. 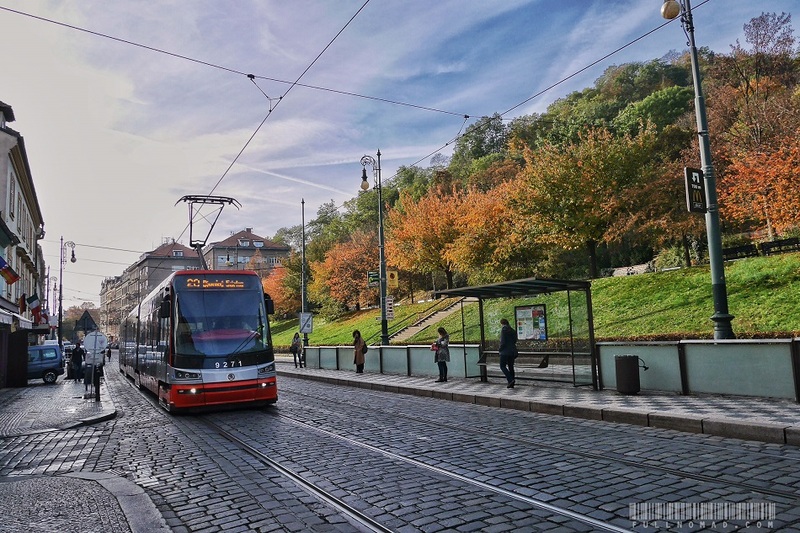 In Mala Strana, a tram zips up the street. Any small disappointments I have with Prague come from me just being late to the party. There are 7.4 billion people on the planet today. There were 6 billion in 1990. Of course cities are more crowded. Math, baby. Transportation is cheaper, faster. Travel is more common. 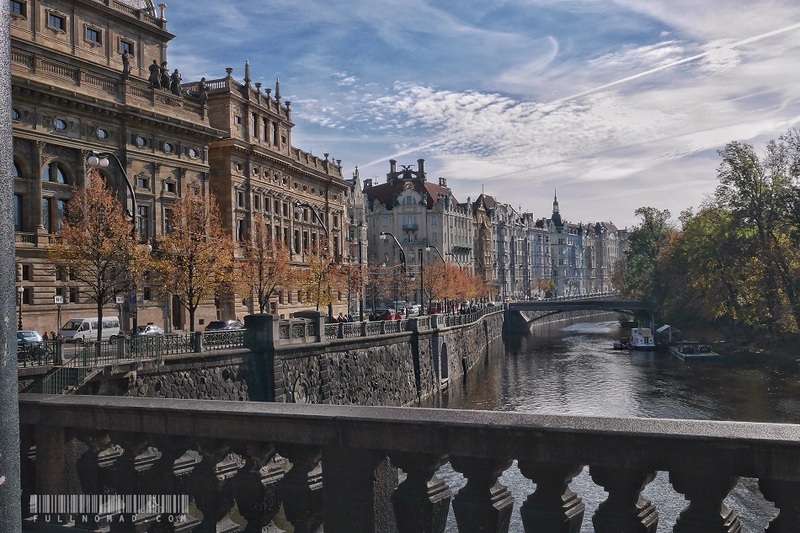 And then, of course, Prague went from being an Eastern Bloc city largely ignored by Westerners to being the fifth-most-visited city in Europe. Only London, Berlin, Rome, and Istanbul exceed it for tourist traffic. Given the political changes in Istanbul, and the looming prospect of potential war there, Prague will rise in ranking in the next year too. But out there, beyond the tourist haven in which I parked myself within Prague, there are areas where creatives still congregate. Creatives don’t tend to live expensive areas, and I’m not an “expensive life” kinda girl. I likely never will be, so ritzy ‘hoods feel untrue to who I am. Next time I’ll do Prague my way; ditch the expedience, embrace the slow. I’m so glad I had this experience, though. 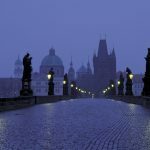 To wake up and walk through brisk predawn autumn air and take photos of the infamous Charles Bridge was a dream come true. Literally. I’ve wanted to do exactly that for most of my life. 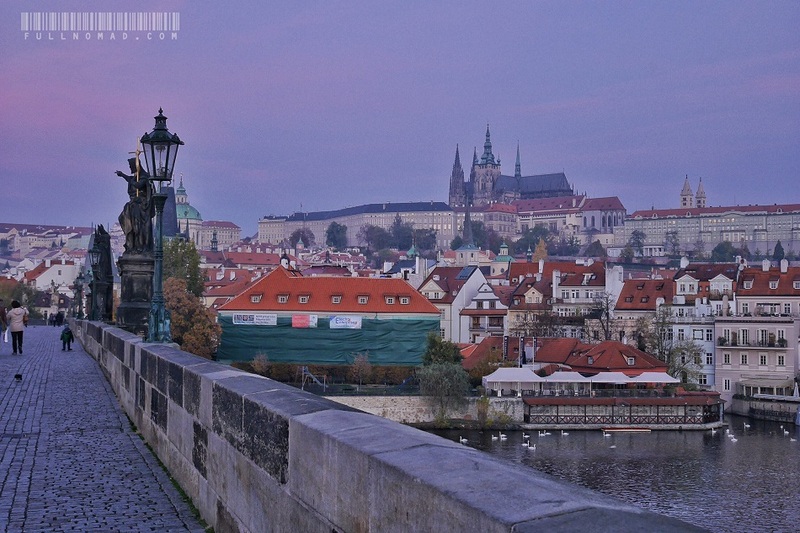 My amazing photowalk on the Charles Bridge yielded exactly the photo I’ve dreamt of shooting there. Seeing the bridge wasn’t all I wanted – I wanted fog and mood, sullenness. Bingo, done. I did the same walk the next day and, when I failed to get the same mood, I was depressed a bit. Then I realized I was on the Charles Bridge for a sunny sunrise and my life is amazing. There I stood, snapping photos, where the jackboots of Nazis and Communists thumped across it, where the hooves of royalty processions clopped over cobblestones for more than six centuries. 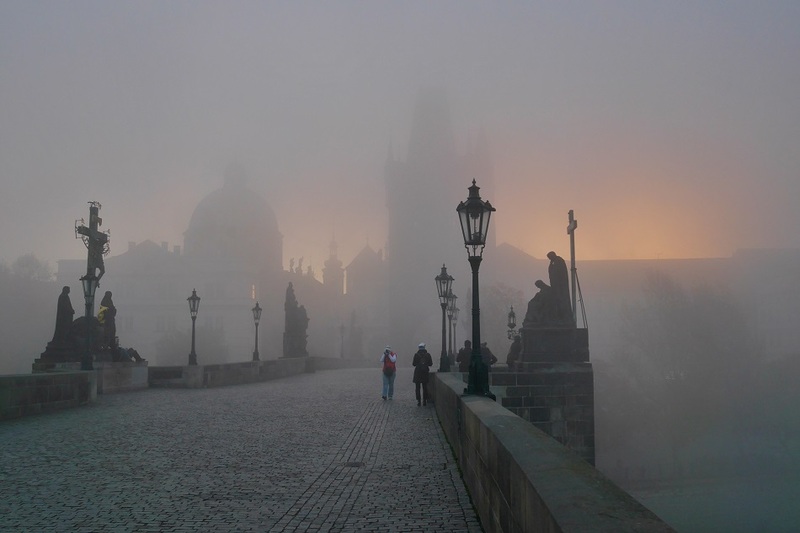 After all, for five centuries, there was no other way to get into Old Town Prague. And I’ve stood there before dawn, shooting photos, enjoyed it when only 10 people in the world were in the same spot. 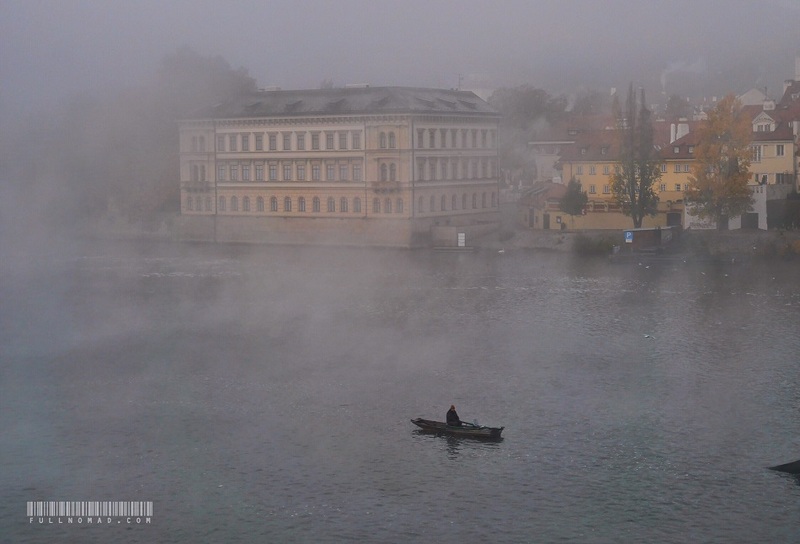 A fisherman gets out early on the Vltava River on a foggy morning. I’ll come back one day, to see beyond tourist traps, to capture the magic of the Zeitgeist long past. Maybe channel that which fed the brilliance of Kafka and other creatives who defined genres and shattered boundaries. For those thinking of visiting Prague, you should. There will be positives and negatives, like any place. Whatever Prague is today from a capitalist standpoint, however jaded it can feel in places, it’s still a city that has pulsed with artists and creatives long before Franz Kafka ever got here. So much history remains. So much beauty. All you need do is walk the Charles Bridge to feel that brimming creativity. It’s undeniable that this city has always defied creative complacency and homogeneity. I also love Prague, as you well know, and I look very forward to heading back. My wife is looking into a 2-week long marionette workshop in Spring of 2017, which could be pretty interesting. I was surprised to see your shots of all of the photographers on the bridge waiting for their sunrise moments. I was there for 10 days in June with my brother. We shot the bridge at 4am and there was nobody there but for a few folks who had stayed out the night, with foot traffic picking up a half hour or so after sunrise, which was around 4:50am if my memory serves. I see that you went up Mała Strana. Did you get to see the Memorial to the Victims of Communism monument that’s up there to the right of where you shot the tram? An extraordinary installation of super-creepy proportion. We visited it during the day and again at night just to get a load of its effect in the dark.